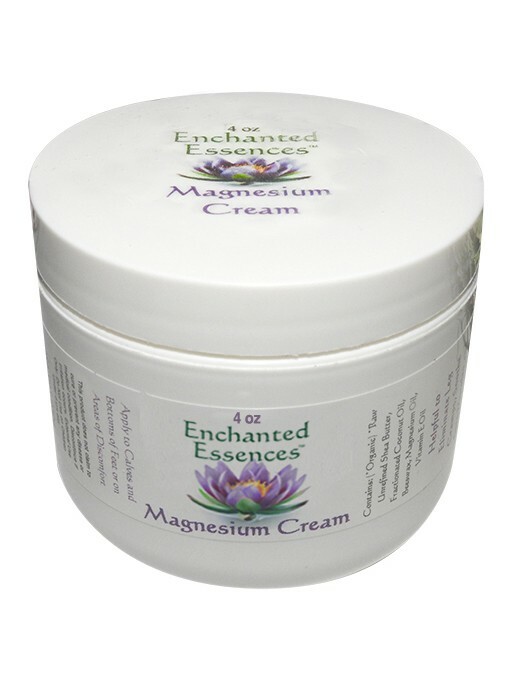 Magnesium Oil passes through the skin and is absorbed into the body. Magnesium a vital mineral for the body, and according to research, a magnesium deficiency is associated with just about every illness. Causes of magnesium deficiency include soil depletion, GMOs, digestive diseases and chronic disease. Magnesium deficiency symptoms include cramps, insomnia, muscle pain, anxiety, high blood pressure, diabetes, fatigue, migraines and osteoporosis. People with GI complaints, diabetes and alcohol dependence, along with the elderly, are at greater risk of becoming magnesium-deficient. Use this Cream on the on your calf muscles to eliminate leg cramps and on the bottoms of you feet to help sleep. Can be used on muscles to soothe aches and pains as well. Handmade with Organic Raw Shea Butter, Beeswax, Magnesium Oil, Fractionated Coconut Oil, Vitamin E Magnesium Oil passes through the skin and is absorbed into the body. Magnesium a vital mineral for the body, and according to research, a magnesium deficiency is associated with just about every illness. Causes of magnesium deficiency include soil depletion, GMOs, digestive diseases and chronic disease. Magnesium deficiency symptoms include cramps, insomnia, muscle pain, anxiety, high blood pressure, diabetes, fatigue, migraines and osteoporosis. People with GI complaints, diabetes and alcohol dependence, along with the elderly, are at greater risk of becoming magnesium-deficient. According to Norman Shealy, MD, Ph.D, an American neurosurgeon and a pioneer in pain medicine, “Every known illness is associated with a magnesium deficiency and it’s the missing cure to many diseases.” Not only does magnesium help regulate calcium, potassium and sodium, but it’s essential for cellular health and a critical component of over 300 biochemical functions in the body. Use this Cream on the on your calf muscles to eliminate leg cramps and on the bottoms of you feet to help sleep. Can be used on muscles to soothe aches and pains as well.